Live in the moment and awaken to the wonders around you as you take a year-long journey with beloved illustrator Katie Daisy. 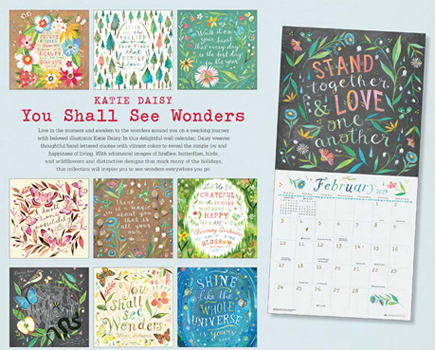 In this delightful wall calendar, Daisy takes inspiring quotes and brings them to life with distinctive hand-lettering and vibrant colors to shine a light on the simple joy and happiness of living. With whimsical images of fireflies, butterflies, birds, and wildflowers that celebrate her love of nature and distinctive designs that mark many of the holidays, this collection will inspire you to see wonders everywhere you go. Katie Daisy strives to capture the magic and beauty of living in harmony with nature. Her expressive watercolor and mixed-media works evoke warm sunny days and walking on wildflower-lined paths, and her signature hand-lettering illuminates words to live by as we navigate the modern world and its challenges. Daisy has created illustrations for the Oprah Winfrey Network, Spirituality & Health magazine, Target, Pottery Barn, Chronicle Books, and Louise Hay. A year of Katie Daisy watercolor artwork on your wall. Colorful nature illustrations with inspiring quotes.